Another great guest post by Bill Cameron. Bill is a bottle digger and collector, and a fellow member of the Nor’easters Metal Detecting Club out of Stamford, CT. He is also a very talented writer, and contributes his stories to the club Newsletter and my blog. Thank you Bill! 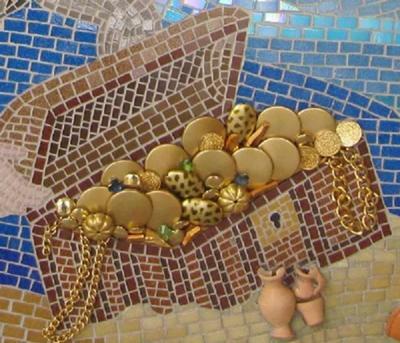 I have always admired the art of making mosaic images. The Romans were masters at taking thousands, sometimes tens of thousands bits and pieces of clay tiles, stones and glass and creating a picture with such color, shading and detail as to dazzle the eye. Looking closely we are all made up of the pieces of metal, clay, and glass that played a tiny part in our lives. Bottle diggers and metal detector hunters often find these pieces, most of which someone accidentally lost. People throw coins in the fountain for luck, but no thinking person tosses away coins deliberately. That 1920 dime you found, could have bought a tired, working man a large diner cup of coffee with a refill and a donut. That brass button fell from a military jacket only when the last thread gave way. The rusty pistol I found at the bottom of a privy was it for protection or something more sinister? My curio cabinet is packed with items I have found such as a child’s clay marbles, a sleigh bell, a doll’s head with no eyes and clay smoking pipes from by gone ages which all have histories that only they know. To many people these objects are just worthless junk but to me they touched and were once part of someone’s life. a meerschaum pipe that I bought for my father at the bazaar in Istanbul. Maybe someday a metal detector may find that fatally wounded cast metal soldier I buried with reverence as a child or those coins I lost on the way to the grocery store while rough housing with friends. I hope so. Remember that every little bit is a piece of us all. Happy hunting and fond memories. Nice article Bill. Thank you…. I once found an gold locket in an old picnic grove and when I opened it there was a very sharp photo of an older lady, which I believe was taken in the late 1800’s (based on the coins I found). There was something very special about that and I always wondered who she was, and if there was a living relative in the area. I still have it…. It would be so awesome to return something like that to a family member. Too bad ther was no indication who she was.